I usually start the day with BBC Tees (as I’m learning to call Radio Cleveland) and early one morning (just as the sun was rising) I heard the Manager of Hartlepool marina talking about the excitement to come later in the week when the QE2 sailed past Hartlepool on its way to the Tyne. He did his best to whip up enthusiasm and announced a fleet of small craft were expected to greet the Lady of the Seas. “Let’s make it a rehearsal for the Tall Ships” was the phrase he used. At the appointed time I went down to the lighthouse on the Headland and saw, absolutely nothing! I later learned from the Hartlepool Mail that the liner had stayed 10 miles offshore as it sailed up the east coast. Come on Cunnard, even the German Imperial Fleet managed to come closer to Hartlepool than that! The flotilla of small craft greeting the QE2 was apparently reduced to a very small number of hardy souls in a restored RNLI Lifeboat and that didn’t make it all the way out to the ship but had to turn back a mile or two short. If this was a rehearsal for the Tall Ship Race then it didn’t give me a warm feeling about the success of the venture. All was not lost however, in a parting remark from the Marina Manager he did say that Hartlepool would be represented on board the QE2 while she was docked on the Tyne. Our Mayor, Stuart Drummond, was one of the VIP’s invited on board for nibbles with the Captain. 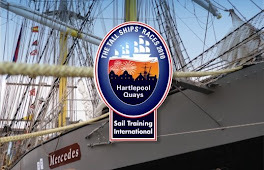 So that’s OK then, complete none event in Hartlepool but Stuart gets a nice day out from it. His usual claim from these junkets is that the contacts he made will help Hartlepool in the future; well at least it will give him something to talk about at his next Tall Ships away day. I can just hear him now “Of course we had the QE2 sail past Hartlepool recently. Anyone watching from shore could almost make her out on the horizon as she went past”. What do Lib-Dems believe in..........?